The slender brass tea pot sits on a flared foot; has a prominent curved handle; an elegant, thin spout; and a hinged, open-work lid topped with a lotus-bud finial. The body which comprises six tapering sides is densely engraved all over with fine Safavid-influenced scrolling, entwined arabesques and tendrils that possibly have been darkened with asphalt. Each of the six sides is decorated with an applied engraved tear-shaped cartouche attached by means of copper rivets, over which a further tear-shaped plaque featuring lace-like open-work tendrils (one of these is now missing; another is damaged.) The open-work of the applied cartouches is mirrored by the open-work of the domed lid. Kalter (1997, p. 325) suggests that applied open-work cartouches are suggestive of a Kokand provenance. The flared foot, also engraved with flower motifs, is enclosed by means of a hammered copper sheet that has been soldered to the base of the foot. 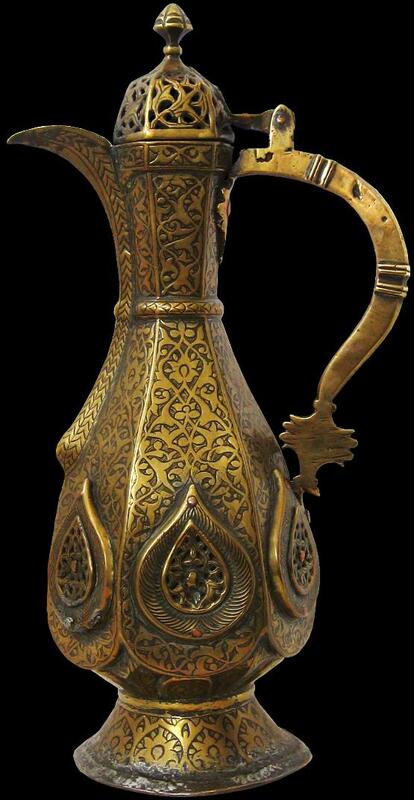 Overall, this is a rare opportunity to acquire a particularly finely engraved Central Asian tea pot that dates to the 17th or 18th century. Kokand (also known as Khavakend) has existed at least since the tenth century, and was an important stop on caravan routes between China and India. The Khanate or Kokand was established in 1709 when a local emir declared independence from the Khanate of Bukhara. The town of Kokand was transformed into a capital with a citadel. A commercial treaty turned Kokand into a vassal state of Russia in 1868. The Khanate of Kokand was declared abolished in 1876.